Claim your health back and take control of your life! So if there are so many foods forbidden, what is allowed? The ketogenic diet is easy and simple. It is not necessary to count calories. You need to know that 70%-80% of your daily calories come from fat, eat moderate protein and eat only 20-50 grams of carbs (depends on what stage of the diet are you - losing weight or maintaining weight). When we keep the level of carbs low the body goes into ketosis, and that is what we want when we follow the ketogenic diet. When eating low level of carbs the body goes into a state of ketosis. When you are about to sit down to eat - check your plate - does it contain fat? If not - add half avocado or a little more olive oil. 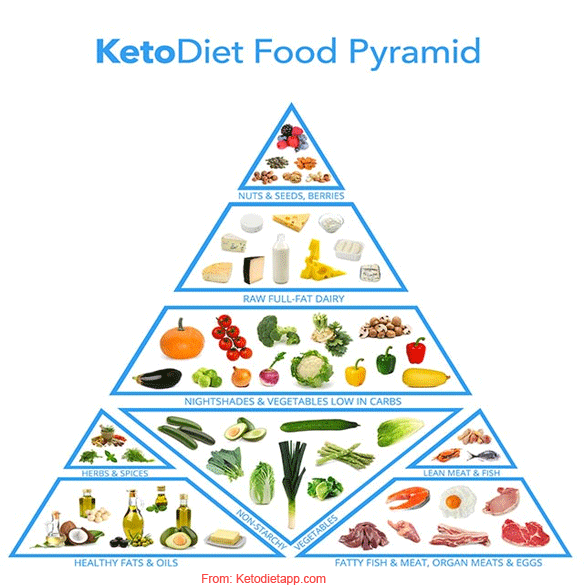 The ketogenic diet food pyramid looks very different from the one we are used to see in the SAD (Standard American Diet - isn't the acronym sad?). The pyramid presents at the bottom in the largest section the good oils, protein - fatty meats, fish and eggs and non starchy vegetables. When moving up - it presents the vegetables that are a little higher in carbs, before the top the raw full-fat dairy (which I don't consume at all) and on the top we can find the nuts, seeds and berries. These should be consumed sparingly. I am not a big fan of nuts or dairy, but I include them here as a guide. In fact I prefer to follow the list of permitted foods of Dr. Westman. You can visit that page to learn about his list of allowed foods. Some keto dieters think that if one can have fat, nuts and cream and there is no need to count calories, than it is free for all! No. In fact you can check this page for a clear list of allowed foods on keto. When following this diet there is no need to add extra fat and to go overboard with the nuts. Nuts and cream will not help you lose weight - they are an additional fat added to the total daily intake. Sometimes it is too easy to eat too many nuts, so I prefer to skip them. I did not start this diet to lose weight, and I did not care about losing weight, but, hey! if it happens, who am I to say no to the weight loss? Fatty parts of organic, pastured raised and grass fed meats - Most meats don't have added sugar. Use them sparingly. I like the seeds in my salads. When following the ketogenic diet, after the body adapts, one loses the appetite and it is easy to do intermittent fasting. We must remember to eat. It is the only way we can get our nutrition. I know that it is really a celebration (in our mind) when food is not the center of our thoughts, but remember to eat. Pay attention to what is in your plate. Every single meal counts. Make sure that you eat a nice piece of protein with it. Have a large salad (at least 7-8 cups of vegetables a day). Don't cheat! Keto is fun, enjoy it!